alaTest has collected and analyzed 239 reviews of Sony Handycam DCR-SR68. The average rating for this product is 3.8/5, compared to an average rating of 4.0/5 for other Camcorders for all reviews. Comments about the zoom and size are overall positive. The portability and image quality also get good comments. There are some negative views about the connectivity and viewfinder, while views are divided on the reliability. We analyzed user and expert ratings, product age and more factors. 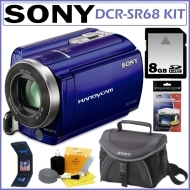 Compared to other Camcorders the Sony Handycam DCR-SR68 is awarded an overall alaScore™ of 84/100 = Very good quality. alaTest has collected and analyzed 95 user reviews of Sony Handycam DCR-SR68 from Amazon.com. The average user rating for this product is 3.5/5, compared to an average user rating of 3.9/5 for other Camcorders on Amazon.com. Opinions about the zoom and price are on the whole positive. The size and portability are also appreciated. Views are divided on the viewfinder, while the reliability and image quality get critical comments. Simple operation; 60x zoom lens; 80GB hard drive; small. Soft, noisy video; noticeable fringing on subjects; image stabilization is electronic only; no mic or headphone jacks. Sony's Handycam DCR-SR68 (and larger-capacity SR88) offers up ample storage and a megazoom lens at a reasonable price; one look at the standard-definition video, though, and you might regret not spending a bit more for an HD model. A compact camcorder with a nice and chunky storage space. I recommend you practice with any camera you buy before using it for real. Seems to me some reviewers didn't do this. Received this as a gift. Was hesitant to take to Italy because it't not a HD unit. However I was pleasantly surprised how good the videos are. The hard drive is large enough to handle most vacations without worrying about the SD card. The still photos are OK but it was easier to carry a small megapixel or phone camera for best results. Used it once. I get better video from my camera. Please, read on! Important stuff here! Lightweight (not a lot, just makes it seem like more quality ;) ) Great quality VIDEO! (Read summary) Loads of features like bright video light, touchscreen, high zoom, large capacity HD and more! After reading some of the reviews before I bought this camera wasn't sure it was the right one for what I wanted to do with it, but so far I haven't found anything negative about it. Capture and store your memories directly to the hard disk drive with the DCR-SR68 Handycam camcorder. A professional-quality Carl Zeiss Vario-Tessar lens delivers high-resolution images, while a 60x optical/2000x digital zoom lets you record close-up action from a distance. Equipped with Face Detection technology, capturing faces is a cinch. In addition to built-in video light, this camcorder has a vibrant 2.7" touch panel display (measured diagonally) which rotates up to 270 degrees for multiple viewing angles.